Bad boys in literature, specifically YA lit, have the ability to make me melt. I am completely serious, they are so effective on my psyche that you’ll have me mopping my brow and fanning myself from the sheer heat of their romantic entanglements. I was never able to pinpoint my first reading dalliance with a bad boy until this week. I was writing a guest post for another blog when I had the epiphany and unsurprisingly, the bad boy came from a YA title. I was eleven when I read the tales of Alanna of Trebold in Alanna: The First Adventure (#1 – Song of the Lioness) and I fell deeply and irrevocably in bad boy love. While most girls would have loved Alanna to have fallen in love and become Queen in marrying Jonathon, I was completely on Team George. Turns out that the author, Tamora Pierce, initially planned for Alanna to end up with her best friend and royal as well, but then realised that didn’t serve Alanna’s wants and needs. George was her readymade solution as he was perfect, he loved her for what she was, flaws and all. Their flaws complimented one another – true love. What is a ‘bad boy’? The Urban Dictionary defines a bad boy as “...a young man who has many characteristics of a naughty boy: he's independent and wilful; he does what he wants when he wants; he doesn't follow trends, they follow him; he often looks scruffy, but hip; he's not looking for trouble, but there's a sense of danger about him. For these reasons and more, he's irresistible to women.” That’s George all over plus more. He’s the Rogue (aka the King of Thieves) of the Tortall Realm at the tender age of seventeen, he’s the breadwinner of his family and despite his untrustworthy trade, he is trustworthy with Alanna’s secret and ultimately heart. It’s telling that most bad boys have had to grow up before their time, either in caring for others or for themselves. Their hearts are normally barricaded by quips and insults and yet their cynicism and bitterness often make the romance the most worthwhile. The point is that they have hearts, their badness is often a label placed on them by a misunderstanding society rather than a state of being. Their capitulation to love is always tortured and toe curling greatness – the best kind of read imaginable. Of course bad boys are normally beautiful....as George is. He’s tall (6”4) – have you ever come across a vertically challenged bad boy? He’s dark with roguish eyes and an ungainly nose – the “too big nose for their face” seems to be a common bad boy factor too, I much prefer it to the one that could befit a Roman statue. He’s muscley and mischievous – basically he’s a delicious concoction! He’s dangerous though, his role in the slums of Tortall demands it. His survival demonstrates his excellence at it. He’s a keen spy, tough but fair in his punishments and charming as all heck. He was a great entree in a huge, lifelong bad boy feast of massive proportions. My love of the bad boy has transitioned from YA literature into that of mainstream pop culture. 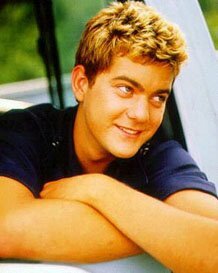 Pacey Witter (Dawson’s Creek) was the archetype of bad boy perfection – naughty, cheeky, manly and one heck of a kisser – seriously check out the head cradle manoeuvre he had down. Later it was Ben Covington from Felicity, Logan Echols from Veronica Mars, Tim Riggins from Friday Night Lights and though I loathe to admit to watching the show, Mark “McSteamy” Sloane from Grey’s Anatomy. Even when they are bad, they are good. Even when they’re acting like jerks, they make you laugh. Even when they are arguing with you, they usually have a point in there somewhere amidst the crudity. Bad boys are ultimately much more developed than any boy-next-door and thus much more compelling, fascinating and watchable. If you still doubt me, think about your initial reaction to Judd Nelson’s character, John Bender, in The Breakfast Club and you’ll know I have a point! A bad boy is capable of beating the crap out of someone – usually in the defence of the heroine’s honour or his own. Though he’d realise that she was capable of fighting her own battles and only step in when truly necessary – the bad boy is the feminist’s best boy. He likes that she swears like a sailor, hates pink and could kick him in the balls. He doesn’t romanticise her but sees the heroine as she truly is, even calling her on her crap a lot of the time. The best kind of bad boy is the one that challenges the heroine’s perspective. Many think it’s the heroine that changes the bad boy but often it is just the reverse, she might make him more honest but he makes her more open to possibilities. And in the end, isn’t that what YA literature is all about – being open to possibilities? My thoughts on YA Good Guys. I love this post. It's like a primer for YA writers, and so spot on! And you know, at the end of the day, Spike beats Angel, Logan beats I-can't-even-remember-that-other-guy's-name, and I think we've established my feelings on Pacey. My favorite bad boy of all time would have to be Dallas Winston. Second, and by a very close margin, is Nick. So much love for Irial!!!!!! Ahh... bad boys. I love 'em all! My first favourite bad boy was Angel, I think. Followed by Pacey (hell yes), Logan, Riggins... in fact, everyone you mentioned! In terms of books, Patch is my new favourite, but I also love Jace with a passion. He is my ultimate YA bad boy! Great post - I'm digging out my Dawson's DVDs so I can re-watch the head cradle! Yay for George! I never really liked Jonathan anyway. This is a fabulous post. I'm so with you on my preference for bad boys in literature (and tv). They are far more complex and seemingly much more driven/goal-oriented. Of course their methods and means of getting what they want may be questionable but that's half the fun. Well as long as it's legal anyway. I'll add Sawyer from LOST to my list of yummy tv bad boys for example. Though he does do the illegal thing....he's still yummy and far more compelling than others. Patch from Hush Hush is my new fav bad boy in literature. What a great character Fitzpatrick has written. I really love the mystery that surrounds him. Catherine (On The Nightstand): I am also team Rosto now..oooh and remember Nawat? I'm also team logan when it comes to veronica mars, the episode where he punches out the guy then they have their first kiss oh so hot! We have the same taste in men. First Pacey then Riggins. We are suckers for bad boys! Also, I have been reading on google reader but the new layout it bitchin'! Oh, and it's Megan McCaffery, not Maureen. Oh, damn now I want me some Marcus Flutie! Ah Logan Echolls...I miss Jason Dohring on screen.. I definitely agree! Bad boys are usually so much more lovable. The good guys usually don't have as much depth or they aren't interesting characters.